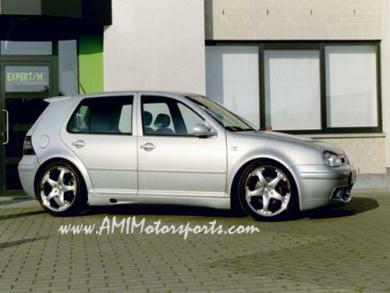 Brand new unpainted Caractere side skirts with mesh inserts for Mk4 Golf/GTI- These are sweet and will pimp out your dub big time! The pictures shown are of a phat dub wearing these exact side skirts, they turn an ordinary dub into a show dub! Go great with the Rieger rear apron also listed on this site, both have matching black mesh inserts. REDUCED PRICE!!! Hurry before they are gone! !